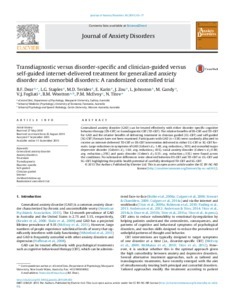 Generalized anxiety disorder (GAD) can be treated effectively with either disorder-specific cognitive behavior therapy (DS-CBT) or transdiagnostic CBT (TD-CBT). The relative benefits of DS-CBT and TD-CBT for GAD and the relative benefits of delivering treatment in clinician guided (CG-CBT) and self-guided (SG-CBT) formats have not been examined. Participants with GAD (n = 338) were randomly allocated to receive an internet-delivered TD-CBT or DS-CBT intervention delivered in either CG-CBT or SG-CBT formats. Large reductions in symptoms of GAD (Cohen’s d ≥ 1.48; avg. reduction ≥ 50%) and comorbid major depressive disorder (Cohen’s d ≥ 1.64; avg. reduction ≥ 45%), social anxiety disorder (Cohen’s d ≥ 0.80; avg. reduction ≥ 29%) and panic disorder (Cohen’s d ≥ 0.55; avg. reduction ≥ 33%) were found across the conditions. No substantive differences were observed between DS-CBT and TD-CBT or CG-CBT and SG-CBT, highlighting the public health potential of carefully developed TD-CBT and SG-CBT.